How to draw Manga hair 4 different ways for girl characters. 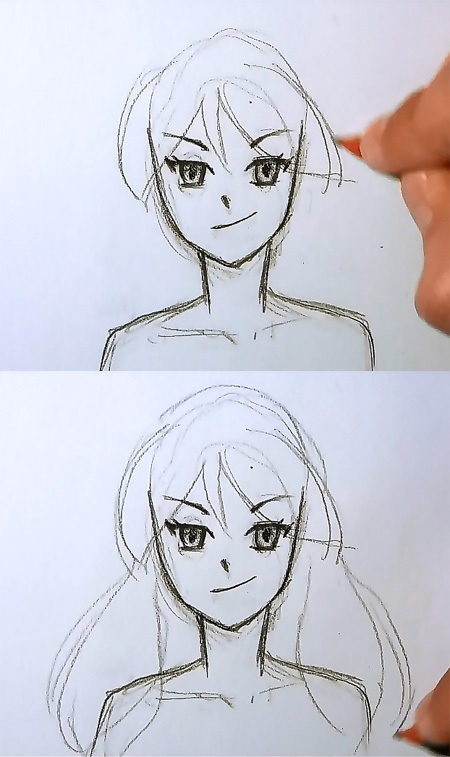 This video shows you how to draw Manga hair 4 different ways. This is a basic lesson on how to draw manga and anime hairstyle. You can scroll down further to see step by step images with instruction. 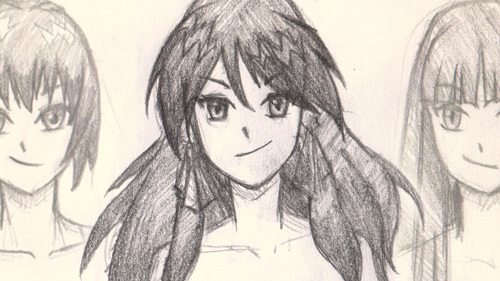 I will go over drawing and sketching manga hair style techniques from rough geometrical sketches to finishing pencil drawing and shading. You can watch the video tutorial demo with narration on drawing hair for manga and also follow the step by step images below to supplement this art lesson. 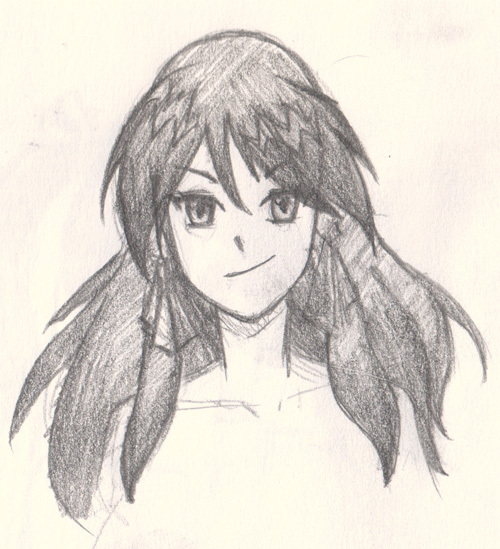 I already have a front view face drawn so that I can just focus on drawing hair this lesson. This lesson will focus on long wavy hair with bangs. The hair has typical soft looking signature manga-spikes that flow downward nicely. Without further ado, I will begin the step by step tutorial! I picked a drawing that was as easy and simple as possible to learn. Looks like this will be another quick and easy tutorial! 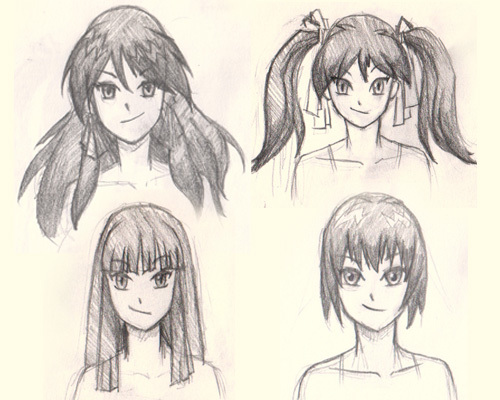 Here is a final drawing of 4 different manga hairstyles. Hair style 1 Long wavy hair with spiky bangs. 1) I started with simple geometric shapes (but imagine it has geometrical form and depth). We begin with three big simple shapes that will become the bangs. 2) I then drew 2 more big simple shapes to illustrate the long fluffy hair that will flow downward to both sides of her shoulders. 3) Since I already have simple shapes as a base, I can now easily go in and draw details over the established big shapes. Drawing hair tip #1: For the spiky manga hair shapes, draw big then small or wide then thin or short and long. Do not make your hair spikes all even or the same shape, they will look strange. It is more natural looking with uneven hair clumps. Drawing hair tip #2: Start with bigger shapes to establish the overall look. Once you have the rough base as a foundation, it will make your drawing a lot easier when it comes time to add details. You might also like these drawing tutorial videos How to draw Anime girl face step by step and how to draw Anime Anime girl body. Go slow and deliberate line. Change up to some new tutorial then come back will also work. Be patient. It takes time. Draw more and you will get better. Thank you, glad to hear it is helpful. Cheers. Congratz, keep it up! cheers! Thanks, I am glad it is helpful. HB or 2B are fine, nothing fancy… no magic pencil. sorry.. what kind of pencil did you use? what kind of pencil did you use.? ?